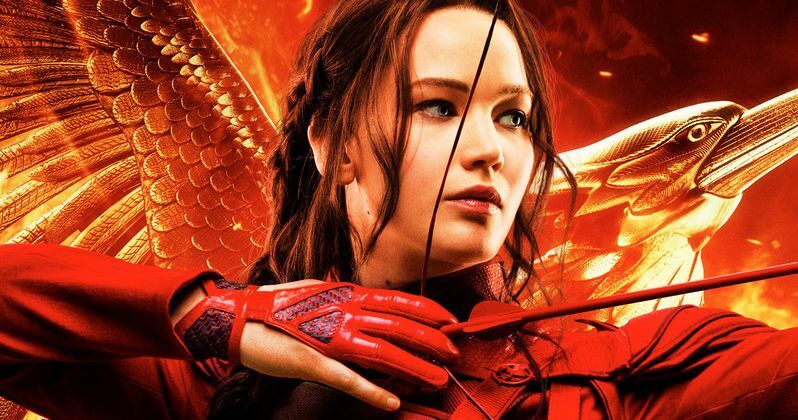 Last weekend's winner, The Hunger Games: Mockingjay Part 2 dominated during its opening weekend at the box office with $101 million, although that tally was the lowest debut of all four movies in the blockbuster franchise. Several analysts wondered if it will be dethroned already in its second weekend in theaters, facing three new releases over the holiday weekend, Pixar's The Good Dinosaur, Warner Bros.' Creed and 20th Century Fox's Victor Frankenstein, all of which opened on November 25, in lieu of the Thanksgiving holiday. As expected, Box Office Mojo reports that The Hunger Games: Mockingjay Part 2 dropped almost exactly 50% in its second weekend, taking in $51.6 million, which was surprisingly enough to overtake The Good Dinosaur. Pixar's The Good Dinosaur, which opened in 3,749 theaters, was expected to take in $60 million in its opening weekend, but it only earned $39.1 million, debuting in second place behind The Hunger Games: Mockingjay Part 2's $51.6 million. The Good Dinosaur is already a hit with the nation's critics, earning an impressive 86% Fresh rating on Rotten Tomatoes. The Hunger Games: Mockingjay Part 2 is still faring well with critics, with a 71% Fresh rating, but its predecessors have all dropped more than 50% on their opening weekend, which isn't a surprise since blockbusters like this are normally front-loaded. While The Hunger Games: Mockingjay Part 2 did have the lowest opening weekend in franchise history, its second weekend drop of 49.7% was also the smallest decrease of the four films, which could mean it will have more staying power than its predecessors. As projected, Creed ended up opening in third place this weekend, but it still exceeded expectations by taking in $30.1 million. This spinoff of the Rocky franchise, which debuted in 3,404 theaters, has an astounding 93% "Fresh" rating on Rotten Tomatoes, with Sylvester Stallone and Michael B. Jordan's performances already being hailed as Oscar-worthy by some critics. Adonis Johnson (Michael B. Jordan), whose father Apollo Creed died before he was born, heads to Philadelphia, the site of Apollo Creed's legendary match with a tough upstart named Rocky Balboa. Once in the City of Brotherly Love, Adonis tracks Rocky (Sylvester Stallone) down and asks him to be his trainer. Despite his insistence that he is out of the fight game for good, Rocky sees in Adonis the strength and determination he had known in Apollo-the fierce rival who became his closest friend. Agreeing to take him on, Rocky trains the young fighter, even as the former champ is battling an opponent more deadly than any he faced in the ring. The weekend's third new release, 20th Century Fox's Victor Frankenstein ended up setting a box office record of its own, although it isn't necessarily the record it was hoping for. The film failed to crack the top 10 this weekend, debuting in 12th place with just $2.3 million, the worst opening ever for a film opening in more than 2,500 theaters. The movie opened in 2,797 theaters nationwide, pulling in a horrid per-screen average of just $840. James McAvoy stars as Victor Von Frankenstein and Daniel Radcliffe stars as Igor in a unique, never-before-seen twist on Mary Shelley's classic 19th century novel. Told from Igor's perspective, we see the troubled young assistant's dark origins, his redemptive friendship with the young medical student Victor Von Frankenstein, and how he becomes eyewitness to the emergence of how Frankenstein became the man-and the legend-we know today. The supporting cast includes Jessica Brown Findlay, Andrew Scott, Freddie Fox, Bronson Webb and Adrian Schiller. The top 5 was rounded out by Spectre with $12.8 million, dropping just 14.9% in its fourth weekend, with a domestic total of $176 million, and The Peanuts Movie with $9.7 million, bringing its domestic total to $116.7 million. Rounding out the top 10 is The Night Before ($8.2 million, $24.1 million domestic), Secret in Their Eyes ($4.5 million, $14 million domestic), Spotlight ($4.4 million, $12.3 million domestic), Brooklyn ($3.8 million, $7.2 million domestic) and The Martian ($3.3 million, $218.6 million domestic). With no films in limited release expanding this weekend, there shouldn't be many surprises in the bottom half of the top 10, but there are a few notable films opening in limited release. The Danish Girl, another awards season contender starring Eddie Redmayne, Alicia Vikander and Amber Heard, which took in $185,000 from four theaters, for an impressive $46,250 per-screen average. It opened alongside Janis: Little Girl Blue, a documentary which earned $24,024 from two theaters for a $12,012 per-screen average.